I have discovered that if you spend long enough and watch closely enough, you will find out what you need to know about your garden. 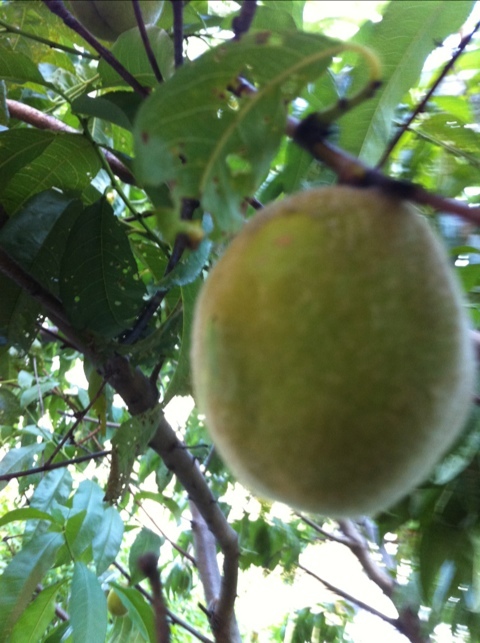 This morning, I went to check on the peach tree and pluck the hopeless ones from the branches. After about ten minutes of doing this, I finally spotted an all green flying insect (she’s in the pic above but you can’t really see her). She was nearly perfectly camouflaged with the unripened peaches. I don’t know if this is what’s plaguing my tree, but it’s the first possible predator I’ve seen after the ants. When I went to Shannon’s on Friday (biding my time till the second plane was leaving JFK for N’awlins), I was told that the peaches with the gooey stuff coming out of them definitely have to go. There will be no eating them. I wondered whether they would go bad on their own, turning brown and soft, if I didn’t pick them. I have seen some like that (see pic above of “The Bad”). Joe at Shannon’s said that it was a sign of a bug who had gotten into the fruit. If I understand what he said correctly, the gooey stuff is the juice of the flesh seeped out after the bug enters or leaves the fruit. I doubt it’s the flying green thing which looked like she was happy to just hang outside the fruit and pick at it a little.